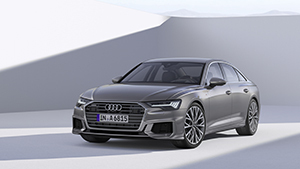 A first class journey with a business class ticket – Audi is upgrading the A6, integrating many of the refinements and innovations that have been so widely acclaimed in the latest A8 luxury flagship into an all-new eighth generation executive saloon. Enveloped by a beautifully proportioned new body bearing the hallmarks of the contemporary Audi design language, the A6 makes considerable headway in virtually every area, from its advanced mild hybrid drivetrains and even sharper yet more comfortable suspension options to its sublime cabin comfort and exceptional new all-digital MMI touch response interface. The new MMI touch response system sets new standards in terms of intuitive operation and personalisation. The all-digital operating system with its touchscreen format provides haptic and acoustic response to inputs and offers fast access to vehicle functions thanks to its logical and flat menu structure. Its configurable favourites buttons help tailor the system to the user’s preferences, and it allows up to seven drivers to store their preferred settings in individual user profiles and set up to 400 parameters. Central vehicle functions can be placed in the required position in the MMI screen using drag-and-drop – similar to the user experience with smartphone apps. The natural-language voice control turns the new Audi A6 into an intelligent dialogue partner and travel companion: It processes questions and commands in two ways, with onboard stored data and also – in conjunction with MMI navigation plus – with detailed knowledge from the cloud. The driver controls the infotainment via the upper display, which measures 8.8-inches in standard form or 10.1 inches where the optional MMI navigation plus upgrade has been specified. The lower 8.6-inch display, located in the console in the centre tunnel, is used for the climate control and for the convenience functions and text input. To create the ultimate high tech environment the fully digital Audi Virtual Cockpit with its 12.3-inch high resolution in-binnacle LCD screen is optionally available, as is a full colour head-up display. MMI navigation plus is even more compelling with the optional add-on modules, including two sound systems headed by the Bang & Olufsen Advanced Sound System delivering 3D sound. Telephony is also taken to a new level in relation to operation as well as sound and connection quality thanks to the Audi phone box with wireless charging capability. Audi connect online services also provide the car-to-X services traffic sign and hazard information. They use the swarm intelligence from the Audi fleet and network the Audi A6 with its environment. Shortly after launch, the on-street parking service will be added, which makes looking for a parking space easier. Using the myAudi app, owners of the new A6 can access the brand’s digital services via a smartphone. As an option, the Audi connect key replaces the conventional vehicle key. It allows an Android smartphone to lock and unlock the car and start the engine. Near Field Communication transfers data to the car. The owner can pass the access data onto five people or smartphones. Even more comfort, poise and safety on long and short journeys – the new and further refined driver assistance systems in the latest A6 set new standards in the class. These include the parking pilot and the garage pilot, which will become available at a later date and will be capable of autonomously manoeuvring the car into and out of a parking space or garage. The driver can get out of the car before activating and monitoring the process using the myAudi app on their smartphone. To do so, the driver must continuously hold down the relevant function key. The parking pilot and the garage pilot will form part of the forthcoming Parking pack. Two other packages will be available at launch - the City assist package includes features such as the new crossing assist system, while the Tour package offers adaptive cruise assist, which supplements the adaptive cruise control by means of gentle steering intervention to keep the vehicle in lane, and the efficiency assist, which promotes an economical driving style. All engines in the new A6 feature new mild-hybrid technology. Here a belt alternator starter (BAS) works together with a lithium-ion battery, enabling the A6 to coast at speeds of between 34mph and 99mph in the interest of fuel economy and to initiate its start-stop function earlier – at speeds of 13mph and below. The engine is restarted from standstill predictively as soon as the vehicle in front of the Audi A6 starts moving. During deceleration, the BAS recovers up to 12 kW of energy. In real-world driving, the MHEV technology reduces fuel consumption by up to 0.7 litres per 100 kilometres (62 miles). The body of the new Audi A6 also adds to the relaxed atmosphere onboard, not least as a result of its advanced aerodynamics: With a drag coefficient of as little as 0.24 (with an engine due for release at a later date) and sophisticated aeroacoustics, the car remains pleasantly quiet, even at high speed. The interior of the new Audi A6 is even larger than in the outgoing model. Legroom in the rear exceeds not only its predecessor but also its core competitors, while headroom and shoulder room measurements in both front and rear are also more generous than previously. The new Audi A6 is noticeably sharper than the outgoing model from a handling perspective as well, thanks in no small part to innovative new suspension options. Customers can choose from four set-ups: the conventional steel spring suspension, the sport suspension, the suspension with damper control and the adaptive air suspension, also with controlled damping. As part of the launch in the European markets, Audi offers the new A6 with two powerful, smooth engines – one TFSI and one TDI. The petrol unit (combined fuel economy: 39.7mpg – 42.1mpg, CO2 emissions 161 g/km – 151 g/km) is a 3.0 TFSI. The V6 turbocharged engine powers the saloon from rest to 62mph in 5.1 seconds using its 340 PS and 500 Nm (368.8 lb-ft) resource, and tops out at an electronically limited 155mph. The 3.0 TDI with 286PS delivers similar performance (combined fuel economy 48.7mpg – 51.3mpg, combined CO2 emissions 150 g/km - 142 g/km), with the help of an impressive 620 Nm (457.3 lb-ft) torque peak. All A6 models will be exclusively equipped with automatic transmission. The 3.0 TDI unit is paired with an eight-speed tiptronic and the 3.0 TFSI with a seven-speed S tronic, and both engines channel their outputs through quattro all-wheel drive as standard. In conjunction with the tiptronic transmission the quattro configuration is based on the more familiar self-locking centre differential format, while the S tronic transmission works with the even more efficient ultra variant, which is capable of engaging the rear axle instantly whenever needed but decouples it during cruising to maximise efficiency. In conjunction with the tiptronic transmission the optional sport differential can enhance handling by actively distributing the power between the rear wheels. Like the dynamic all-wheel steering, the controlled damping and the adaptive air suspension, it is integrated into the control function of the electronic chassis platform. These systems are closely networked for innovative precision. The driver can select various driving profiles via the Audi drive select system – the wide spread from Comfort through to Dynamic is even more pronounced than in the outgoing model. Like the A8 and A7 Sportback models, the A6 is a key exponent of the new Audi design language. With taut surfaces, sharp edges and striking lines, the business saloon unmistakably conveys its sophisticated, dynamic and high tech character. The exterior stands out with its balanced proportions – long bonnet, long wheelbase and short overhangs. The wide, low-slung Singleframe grille, the flat headlights and the powerfully contoured air inlets lend a suitably purposeful air. In the side view, three striking lines reduce the car’s visual height. The powerfully taut contours, which are drawn over the wheels, are testimony to Audi’s quattro genes. The lighting design emphasises the technical character of the A6. Three headlight formats are available, the most sophisticated being the HD Matrix LED headlights, recognisable by the five horizontal lines which form the daytime running light signature and emphasise the width of the front. Above them are the dipped beam modules. Upgraded tail lights with a special light signature made up of a single horizontal line and nine vertical segments for each unit are available as an option, and the areas in between these are filled by the brake light. Dynamic indicators are included with the top-of-the-line equipment. When unlocking and locking the doors, a pulsing coming and leaving home function brings to life the combination of design and technology that is the hallmark of Audi. Inside, two lighting packages are available: the ambient lighting package and the contour ambient lighting package. Both subtly animate the space, the volume and the materials. The interior of the new A6 features a black-panel design – a cool look which expresses the technical competence and digital character of the executive saloon. The sleek instrument panel and the calm, continuous horizontal body line create an airy sense of spaciousness. The centre console is directed towards the driver, as is the top MMI touch response display, which almost disappears into an aluminium clip when switched off. The new Audi A6 will be produced in Germany at the Neckarsulm Audi facility and will become available in the UK in the summer. UK pricing and specification will be confirmed nearer to launch. I took off all locking bolts and replaced with normal ones. as they get damaged very easy and may end up on road side not getting them off when needed. Thanks but unfortunatelly i dont have acess to odis vag k+can commander on the way, with this anyone can help me out?